I mentioned a while back that I was having some issues in the day job. Those issues are not yet resolved, sadly, mostly due to the crapshoot that is the research funding roulette wheel. I've been thinking very seriously about starting some kind of fibery business venture. With that in mind, I've been playing around with different types of handspun yarn, trying to get an idea of how much time it takes me to spin up X number of yards. The first ventures have centered around singles yarns. This is the skein of Corriedale singles I spun up during the Tour de Fleece. 1.5 hours, 227 yds. Not too bad for 90 minutes work, but my hands and wrists were pretty tired by the end of it. So I wanted to try again with a different fiber, just to see how it went. 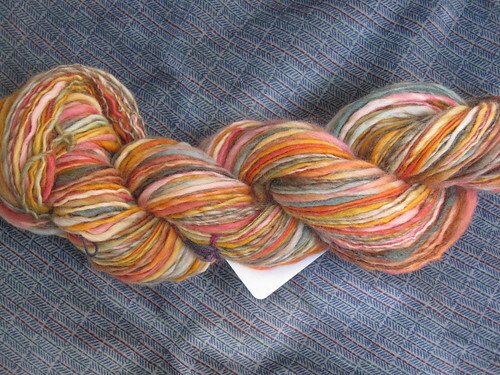 Fiber: Hello Yarn Merino in "Harmonia"
Spun at 8.5:1, 282 yds. The ratio was a bit high for the final yarn - I wanted to add a bit more twist then I did with the Corriedale, given the shorter staple length of the merino, but the thin bits are a bit overtwisted. It will probably come out fine in the knitting, but we'll see. I also fulled the yarn when I finished it - three shifts between hot and cold water baths until the single started sticking together. The finished yarn is nice and fluffy where it's not overtwisted. This skein took me 2 hours to do, but my right wrist and hand were still a bit unhappy. I didn't do any predrafting with the fiber, just stripped it into sections (6 I think). I think that next time I'll do a bit more predrafting just to loosen the fiber up a bit more and make it a bit easier to spin into a single. I also might try to keep the single a bit more even next time and see if that helps the wrists. If I were going to charge £10/hour for my labor, these skeins would end up at £30 and £35 respectively with the cost of the fiber, which works out to £0.13 and £0.12/yard. From my research, singles yarns are being priced at anywhere from £0.10-0.50/yard. That's quite a spread, with art yarns running on the higher end of that scale.What would you spend for handspun yarn? Would you rather get a full 4 oz or standardized skeins (i.e. 100 yard skeins)? 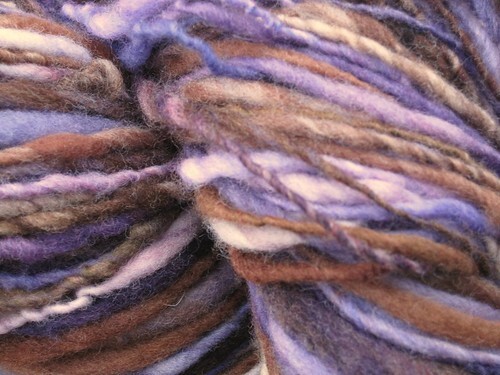 Would you rather thick and thin singles, even singles or multiplied yarns? Please do leave a comment if you have any thoughts along these lines. Thanks! 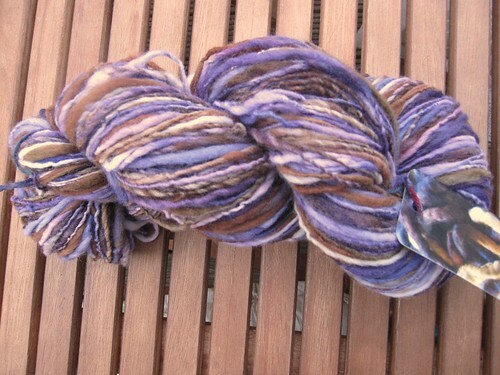 Written by porpoise On August 12, 2011 In "handspun", "spinning", "stash"